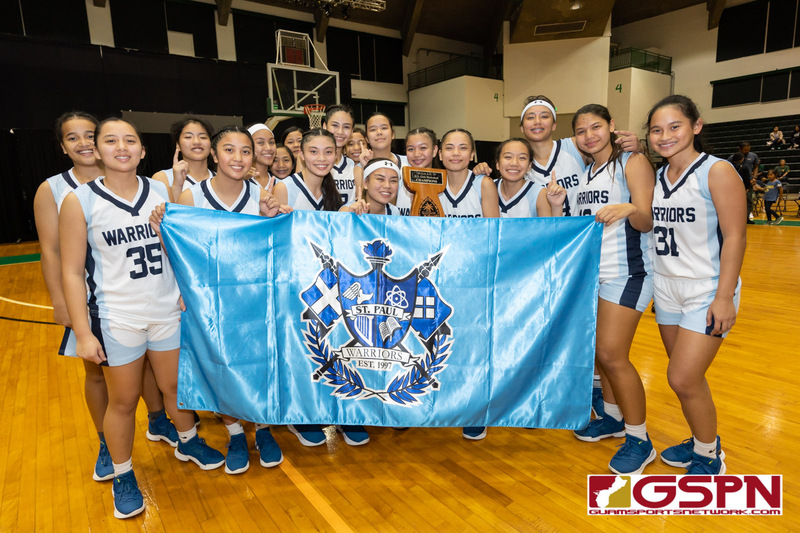 The St. Paul Lady Warriors finished their 2018 season undefeated, securing their second straight IIAAG Girls Basketball title in a row after defeating the Academy Cougars 51-34 at the UOG Calvo Field House Friday evening. The Warriors were unstoppable the entire 2018 season, blowing out teams by large margins behind a dynamic squad who proved capable of doing it all. The Championship victory was highlighted by what Warriors fans were accustomed to seeing all year: high pressure defense and layups in transition. The Warriors have shown great ability to push the pace for all 32 minutes and showed almost no signs of fatigue. St. Paul’s Janniliese Quintanilla, who is only a sophomore, dominated in impressive fashion in the Championship matchup to earn her Player of the Game Honors with a 22 point eight-steal performance. It had been a competitive matchup until the third quarter, when the Warriors began to pull away. It was in that quarter that the Warriors began to push tempo, playing with the high intensity that they have become known for. Quintanilla, who has been one of the Warriors greatest weapons all season, found her rhythm in the third. Her stellar quarter performance began with a three-pointer that gave her team a double-digit lead at 32-21. St. Paul decided to take some time off the clock in the third at the three-minute mark, but as Academy began to gain offensive momentum, they opted to change their strategy and push the pace. Academy managed to cut the deficit back to single figures after a score by freshman Myka Terlaje. But after the play, Warriors Isla Quinata initiated a beautiful offensive play in transition. A steal, and then a bullet pass, allowed teammate Kirsten Silva to find Quintanilla in the paint who scored on the inside. The play was picturesque and made for the highlight of the game. Following the play, the Warriors led at 35-23. From that point on, the Warriors began to ride the momentum and continue the pressure. Quintanilla would gain another steal after the play and score in transition, forcing the Cougars to call a timeout and to try and stop the momentum. Following the timeout, Mia brought up the ball and was swatted by Quinata, but Academy maintained possession. Then, former Cougar Kirsten Silva stole the inbounds pass, setting up Quintinalla for a score. Quintanilla scored eight straight points to give her team a comfortable lead coming into the fourth. “Our defense was key in allowing us to pull away. It’s something that our Coach always stresses,” said Quintanilla, on her dominant performance in the third quarter. Quintanilla finished the game with 22 points, eight steals, and six rebounds. The first half consisted of dominant interior presence from the league’s MVP in Mia San Nicolas. San Nicolas was doing it all: scoring inside, blocking shots, and breaking the press with her ball handling ability. San Nicolas opened the game, scoring the first points off of a left side floater. The Cougars were able to break the press in the first half as San Nicolas inbounded the ball on each possession, trailing her guards and bringing her ball handling ability and IQ to help avoid the high-pressure press of Saint Paul. Her defensive presence was also outstanding, racking up six blocks in the first half alone. Despite the heartbreaking loss, San Nicolas stayed in good spirits. “This was a great experience. I’m thankful for everything. I just wanted to enjoy my last game with a positive spirit, and even if we lost I’m still happy because I just love playing the game,” said Mia. San Nicolas finished her final high school game stuffing the stat sheet as usual, finishing with 17 points, 26 rebounds, and 12 blocks. She officially checked out of the game with 3:15 left in regulation. Nonetheless, this is not the end of Mia’s basketball career and anyone who has seen her play can attest to that. She is hopeful for what the future holds. “I know that today is not the end of my basketball career and I’m looking forward to what comes next,” said San Nicolas. Quinata wrapped up her final game making an impact on the defensive end, finishing with five steals and five assists. Saint Paul added plenty of new talent throughout the course of two seasons. But having lots of talent does not always guarantee success. The pieces need to be able to come together and mesh in order to be effective. When asked about whether it was difficult putting all these new pieces together to play as a team, head Coach Paul Pineda gave all the credit to his teams willingness to work. “I think that a lot of people believe that we just show up and win, but they don’t understand how hard we work. I really believe we are the hardest working team out there. Anyone that’s been coached by me understands how demanding I am as a coach. We wake up and practice at 6:30 every morning and no one misses practice,” said Pineda.